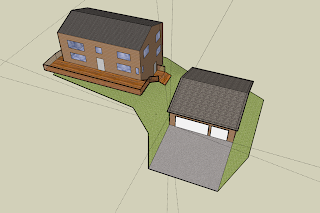 While figuring out what we wanted to build, I used Google Sketchup (the free version) to create a 3D model of the house and garage. Working with 3D takes a bit of getting used to, but it's very similar to the solid modeling I was doing to make custom 3D printed parts for my homebrew phone, and Sketchup is very good at getting these kind of artists-impression images created. 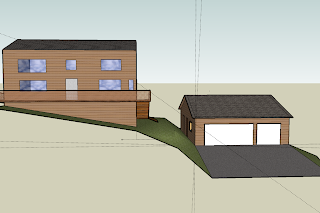 The house really is a box, and the full width deck with steps going back down the side doesn't exist yet, but I was able to get the relative position and size of the garage about right so we could see if it fitted in. We then went to TuffShed and got them to draw up plans for our oversized garage. If you get a garage custom "stick built" at the site, the cost is quite high, mostly labor. Tuffshed pre-fabricate the parts, ship them in, and put up the entire building in about three days. The cost (not including foundations) is about $30K for an 1150 square foot triple wide garage (32ft wide, 36ft deep), with a 16ft wide double door, 8ft wide single door, and 10ft high ceilings. The basic cost is more like $20K, but it cost extra to go from 8ft to 10ft ceilings, and we added a bunch of other extra options. So far, we have had a few minor issues getting the Tuffshed plans approved by the county planning department. Really just clarifications of materials and codes on the drawings, but the first two tries have failed. Everything is now approved apart from the final tweaks to the drawings of the garage, so I'm hoping to get it taken care of next week. We live out of town, on top of the Santa Cruz mountains. This makes a few things easier, we only have Santa Clara County to deal with, no city rules. We also have more space. The downside is that it can be hard to find people to work on the house, and it can cost more to deliver heavy stuff like gravel than it costs to buy it. The complications start with a scenic highway. We can't build anything within 100ft of the road, Then there is a well, we can't do things within a 100ft radius of that. Then there is a septic tank and leach field. The leach field is two banks of 250ft long buried perforated pipes which occupies a lot of space, including the space that we want to put a garage on. Then a driveway has to find it's way through and have a turn around area big enough to take a fire engine. All of a sudden, a few acres of land is full. A few years ago we got a plan drawn up for a modified leach field layout. This removed the upper 250ft field so that we could put the garage there, and added a new 250ft field below. To comply with planning rules we had to show that we could on theory add another 500ft of leach field if the first one failed. So that took up almost all the space. After all that the biggest possible garage we could fit is a free standing building 32ft wide and 36ft deep. It will have one single and one double door and sit alongside the house about 20ft away and slightly downhill. To prove that the space existed I got my local ground moving specialist Bob Whalen to use an excavator to dig holes and locate the leach field pipes, and made a big flat area in the right place. Along the way we destroyed the upper leach field before I got permission, we got told off but since the rest of the plan made sense we got away with it and were able to move forward. At some point the county realized that the plan they had for my driveway bore no relation to what had been put in by the people who built the house, this raised the spectre of a grading violation and possible grading permit, which would be needed if we had to move more than 150 cubic yards to get a driveway that conformed to code. With a lot of help from Terry and crew at TS Civil Engineering we ended up with a plan for the driveway and leach field that met code, didnt raise a violation and didn't need over 100 cubic yards of grading. With a few tweaks the county finally approved the plan. I'm going to blog about cars over the coming months, partly because I'm about to start building a big garage to keep them in and I want to document the process. We bought a house about 5 years ago that had a wooden shed as it's single garage. We had five cars at the time and there seemed to be enough space to build a big garage. However other priorities intervened and it wasn't until the middle of 2009 we finally got serious. The first action was to make a large flat space, to see how big it could be, then we got bogged down in the planning process and this week we finally have the key approvals in place! If you were thinking of joining Netflix, click this link to get a two week free trial - it's a new affiliate program that Netflix is starting via the Google Advertiser Network. I will update the free trial link in my iPhone app in the next version.